The Ladder Assembly Table is simply a ladder that provides a solid base for building your hollow wood paddleboard kit. This table is used for gluing panels, attaching your ribs to the fishbone and serves a base for the rocker table. The important role of the assembly tables is that it is flat and raises the board to a comfortable height. If the assembly table has any imperfections, twist, crown, sag, they will transfer into the finished paddleboard. 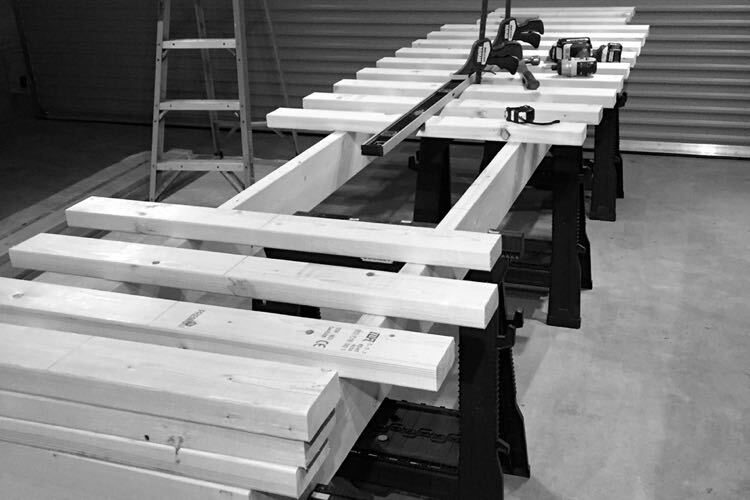 You can build the assembly table out of pretty much anything that can support the weight of the clamps but 2×6 lumber is recommended for the base. If you use screws to attach the rungs you can disassemble the table after you are finished and reuse the lumber. Loosely place the rungs on the base so that you can use the fishbone as an alignment gauge. Attach the first and last rungs to temporarily. Attach a spring clamp to hold the nose and tail of the fishbone to the secured rungs. With the fishbone securely anchored at the nose and tail you can start attaching the rest of the rungs. Use the notches in the fishbone as a guide for aligning the rest of the rungs. Each rung should be aligned and squared with one edge of the notches. (Image below) Check to see of the first and last rung need to be adjusted since they were only temporarily attached. If the assembly table is built in this fashion the front face of the 2×4 rungs can be used to support the rocker table risers. Note the notch near the nose and tail does not always match the spacing on the rest of the notches. This is due to the boards overall length. 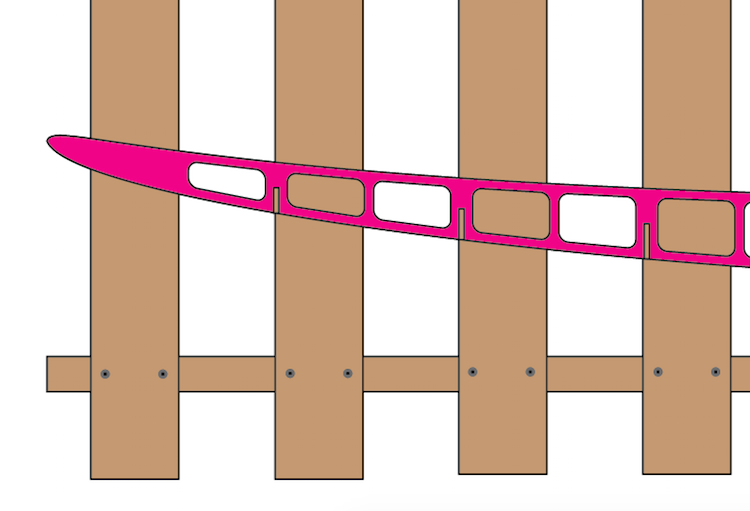 As a final check, attach a string from corner to corner forming an X in the middle. The crossing strings should just touch with either string on top. If they do not, the table has a twist in it. To remove the twist shim where the base contacts the sawhorse until everything is in perfect alignment. Mark the location of the shim and the location on the floor if the table has to be moved during construction.